The process of Biblical Meditation is one of the main ways I've grown my faith over the last couple of years, but man, is it ever hard to find directions on how to do it! I've spent a lot of time researching and reading and I'd love to share insights I've gleaned. 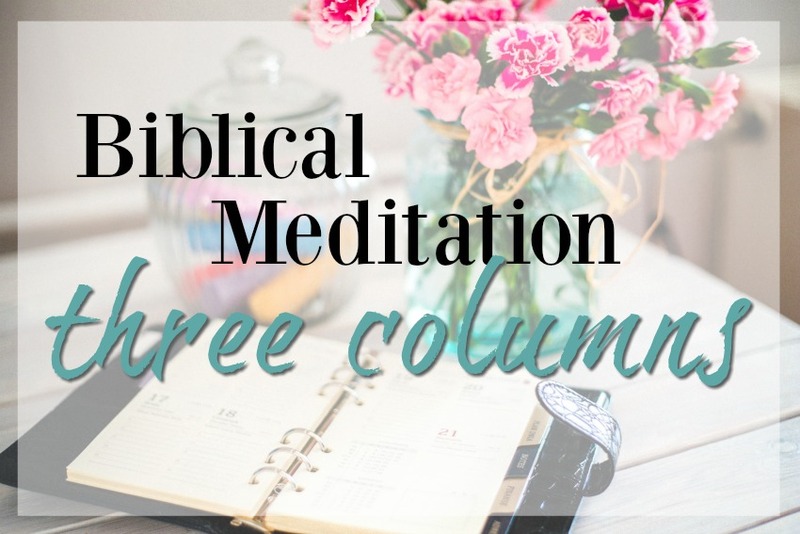 So in the same vein as the Prayer School series of posts I started to last year, I'm going to do an ongoing series of posts on different ways to do Biblical Meditation. I hope you'll join me, learn, and work it in to be a part of your regular quiet time. There are a myriad of ways to meditate, and we'll walk through the 3 column way of meditation first. It's a simple but powerful way to dig a bit deeper into scripture. In fact, it's so simple children can do it, but it is rich and deep for adults too. Turn a paper or a journal sideways, so it's in "landscape" format. At the top of the page, write the scripture reference or the specific topic you are working on. In column two, re-write the verse in your own words, but simplify it so a child could understand. Below that, write out things that you notice from that verse. In column three, write anything that this scripture causes you to wonder about. Are there points that confuse you? Are there questions that you have for yourself? (Such as: Do I believe this? Do I apply this to my life? Write out any questions or statements you come up with.) Below that, write out some application points that you could put into use for your life. Make these very specific and do-able. For example, if one application you come away with is to spend more time in the Word, write out specifically when and where you will do that. To help make it a little more clear, I've made a PDF file that you can print out and use as a guide. Just click on the picture below to be taken to the PDF. This is a great way to easily dive into Biblical Meditation and it is very flexible. You could do it all in one sitting, or do a column a day, or even one point per day. Work it into however much time you have. If you try it out, I'd love to hear what you think either in the comments below or through my email contact on the side bar. Need suggestions on where to start? Great verses to meditate on (even if you are familiar with them) are: John 3:16, Romans 8:1, Romans 8:6, Romans 8:18, Romans 8:28, Romans 8:31--Pretty much all of Romans 8 is full of deep, rich passages to work through! Don't miss the Journal and Doodle Bible studies, where meditation is built into the study as we go chapter by chapter through different books of the Bible. You can find all of them here. This is so easy and do-able! I think I will start to use it with my son! He has learning disabilities and this would really help him to focus on a scripture so he can hear God's voice through the Bible. Yes! It's wonderful to be able to use this with all different ages/abilities and everyone can get something out of it! Thank you for your input always, i look forward to doing this each day. I often overlook important nuggets of gold in his word, and often go by mal-nutritioned. So glad you're going to try it! This is wonderful. Thank you for exploring this and then sharing your findings with us. Are you still working on more Bible studies. I'm in my first and am hoping there is many more to come. It is all soooo exciting. Yes! In fact in just a few weeks I'm hoping to have 1 John ready to go! Coming SOON! Thank you! You are such an inspiration to me. I hope to get better at spending time in the Word, though with a 5 month old who still is up to nurse a few times at night, its hard to make the time. But to make the time is worth it. That is a hard age to do ANYTHING with consistency! Give yourself lots of grace and do what you can. I know it's hard to do anything with lack of sleep! I am thrilled to see that you are continuing to share on meditation (and prayer). These are my top two this year as they are what I struggle with the most in Christian devotion. Thank you for your continued insight! 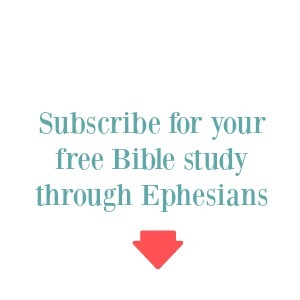 I just started your Ephesians study and I am loving it! 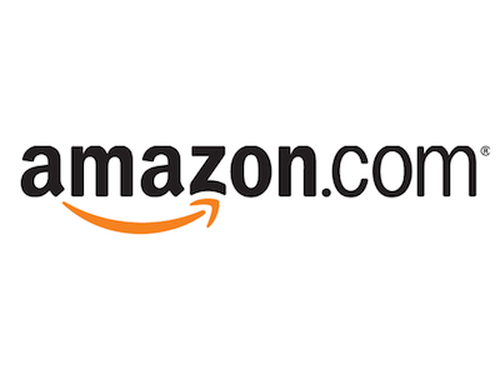 Thank you for all that you are doing on your site. It sure is a blessing! Thanks so much for your consistent challenges put forth to the rest of us. 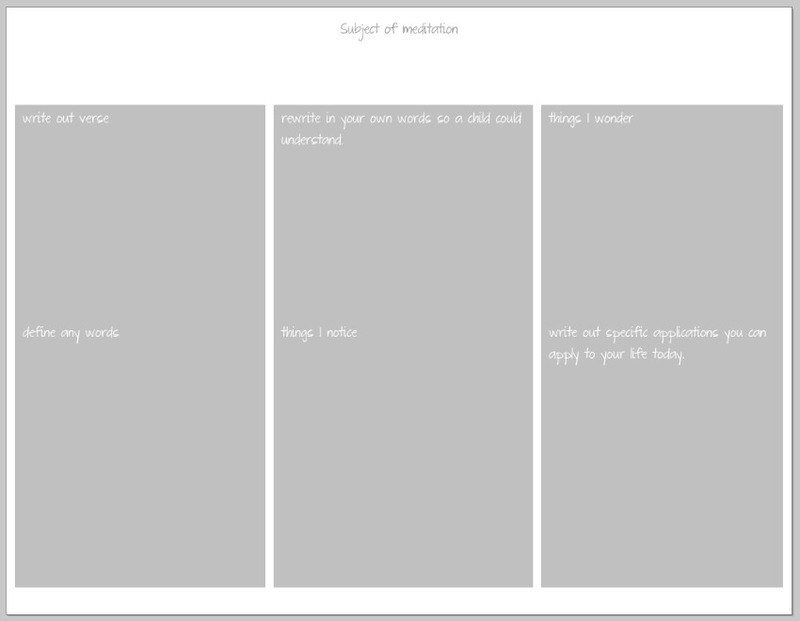 I really appreciate the doodles and Bible studies and now some more forms for meditation. This looks really good. I look forward to using it. I am loving using this in the EphiDiana study! 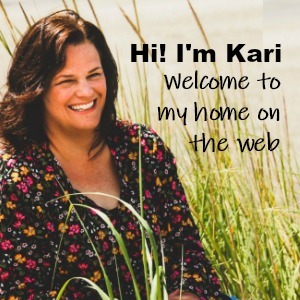 Kari, thank you much for such inspiration! I'm now in my late sixties and have done Bible studies for years, and frankly, have been a tad weary of the same ole ... I'm excited to try this, including your journal/doodle method! In the second or third column of this meditation journal, if the verse is appropriate, it's helpful to put it in reverse -- or in the negative. IOW, Proverbs 3:5-6, if I Do NOT trust in the Lord with all of my heart, and continue to lean on MY own understanding, He will NOT make my paths straight.